Trove, the social news reader first created by WaPo Labs, has a brand-new look for the new year. Amazon’s Jeff Bezos bought the newspaper, but the decades-long Washington Post reigning family, the Grahams, kept other assets of the business, including Trove. 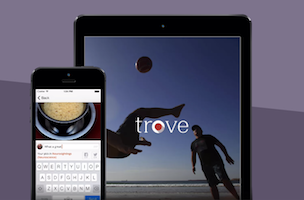 Now Graham Holdings is giving Trove a new shot at success. The iOS and web app filters news “from thousands of sources,” while users select which “Troves,” or subjects, to follow for news. You can choose from standard fare, such as politics and tech, special celebrity-curated topics, or create your own curated Trove. Users can pick posts to recommend for others, add a comment, or share directly to their Facebook or Twitter stream. The refreshed app launches with a dozen featured curators. The Trove engineering team has spent years tuning machines to read, understand, and personalize the news, but that’s only the beginning: with Trove, people always come first. The stories that lead off troves are picked by “curators” who are passionate about a topic. You can read my picks about “Star Wars”… and maybe I’ll follow your trove about “Bitcoin” or “the Marvel Universe” to see the best story picks on topics you care about. Algorithms are smart, but people are smarter. So on Trove, curator picks appear at the top.